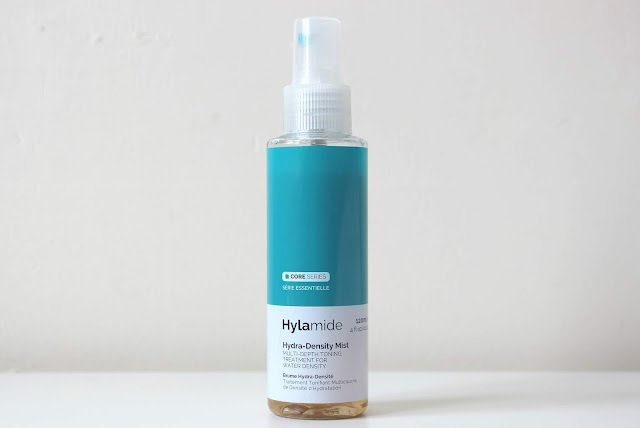 The Hylamide Hydra-Density Mist* is another hydration focused skincare product from affordable skincare brand Hylamide. An advanced treatment mist, it's been formulated to provide your skin with an intense yet lightweight boost of hydration. I've been using Hydra-Density for around 5 weeks now in both my morning and evening routine, as a skincare toner, in the morning following a clarifying toner and in the evenings following an exfoliating toner. It boasts a higher water-retaining capacity than hyaluronic acid, which is quite a bold claim, by using marine exopolysaccharides with glucuronic acid, which is said to not only offer immediate hydration but long-lasting oil-free hydration too. Using synergistic plant biotechnology, with purified green tea polyphenols and golden eye grass root, it works to soothe skin instantaneously on application as well as helping to reduce areas of irritation when using long-term, with Tasmanian pepperberry, which also helps to reduce signs of redness and inflammation. Scent wise we're talking barely noticeable, so this is a great option for those of you who prefer your skincare to be scent free. A 120ml spritzer bottle costs a very reasonable £15 and it has one of the best spritzers I've used yet, providing an even application over your face. I do find continued use has helped my skin, it is a lovely hydrating toner; but it's not the most hydrating toner I've come across over the years. For a budget product, it does the job well and it's one I'd certainly look at repurchasing. On a more superficial level, I really like the branding for Hylamide products and I like the way they stand out from other skincare products in my routine. Looking to try some Hylamide products but not sure where to start? Maybe Hydra-Density Mist will be the one for you.